Carl Bergner, Shirley Temple doll look a like character doll, 23" tall, bisque socket head, single stroke painted eyebrows, real upper eyelashes, blue sleep eyes, open mouth with six upper teeth, dimples in cheeks, composition jointed body, doll mark CB intertwined inside a circle Germany as shown on left. Carl Bergner of Sonneberg, Thuringia, Germany is best known for his bisque multi-face dolls first patented in 1904-1905. 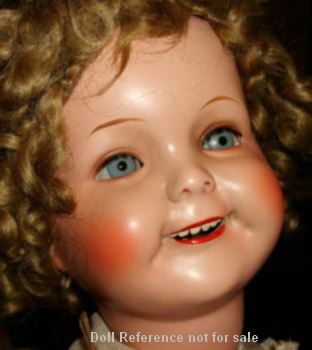 The dolls have two or three faces each with a different expression; crying, laughing, sleeping, white or black faces, that can be rotated from the top of the head. Bisque head dolls have a cloth body with composition limbs or all composition jointed body. 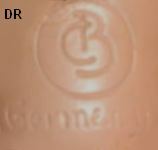 Bergner also made high quality single face bisque head dolls. Some Bergner bisque doll heads were made by Simon & Halbig. or C.B. (found on their multi-faced dolls).